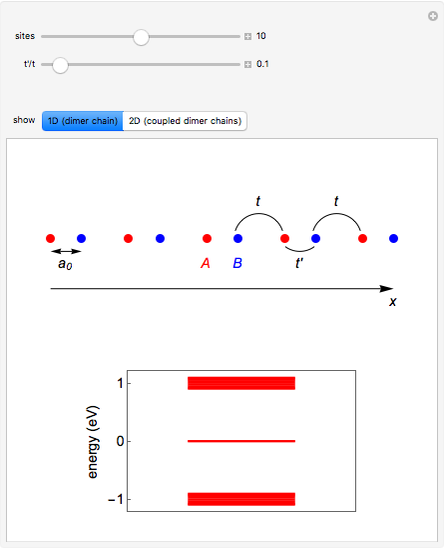 This Demonstration shows two simple toy models for the appearance of zero-energy states in a one-dimensional (1D) system such as a simple finite chain of dimers and a two-dimensional (2D) system built from coupled finite chains of dimers. 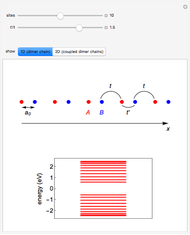 The electronic Hamiltonian matrix is solved in both cases within the tight-binding formalism, where is the hopping matrix element between -type and -type sites, whereas is the hopping matrix element between -type and -type sites within each finite chain. 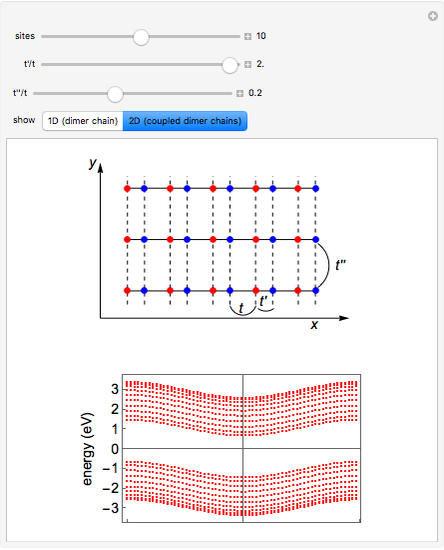 In the 2D case, the inter-chain coupling parameter affects the dispersivity of the electronic bands: if , the bands are almost flat. It was shown in  that tuning the ratio introduces anisotropy into the system, therefore inducing a topological transition governing the localization properties at the system edges. Hence, if , there will be no zero energy states, whereas if , edge states appear in the electronic spectra. rationalizes this topological transition in terms of a geometrical phase, the so-called Zak phase, which is equal to in the presence of edge states; otherwise it is zero. 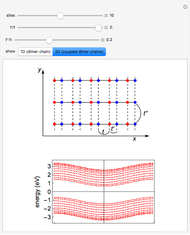 The Zak phase is related to another relevant geometric phase (the Berry phase) by contour integration over the first Brillouin zone (see  and references therein). 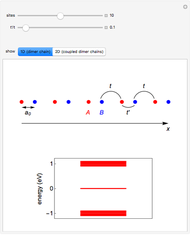 The first slider in this Demonstration lets you set the number of sites in the finite chains and hence the size of the Hamiltonian matrix, thus affecting the number of electronic levels or bands displayed in the related plots. 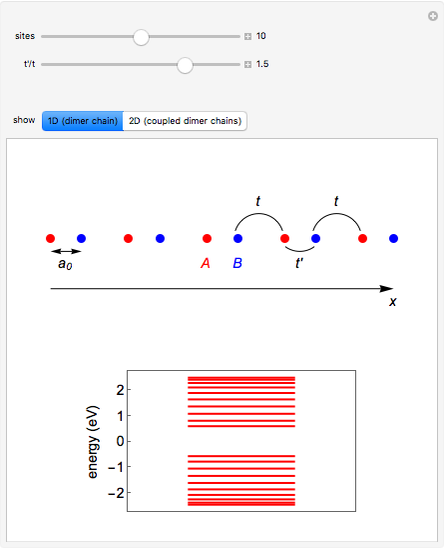 The second slider control lets you explore the onset of the topological transition above or below the threshold value , whereas the last slider, related to the ratio, is enabled only for the 2D case, since it determines the dispersivity of the electronic bands. P. Delplace, "États de bord et cônes de Dirac dans des cristaux bidimensionnels," Ph.D. thesis, Université Paris-Sud XI, France, 2010. tel.archives-ouvertes.fr/tel-00607781/fr. P. Delplace, D. Ullmo, and G. Montambaux, "Zak Phase and the Existence of Edge States in Graphene," Physical Review B, 84(19), 2011 pp. 195452–195464. journals.aps.org/prb/abstract/10.1103/PhysRevB.84.195452. Jessica Alfonsi "Models for Edge States in the Electronic Spectra of Dimer Chains"